Blake convinces the crew that it would be a good idea to destroy one of the Federation's communication sites on a planet called Saurian Major. Despite some objections from Avon, everyone else takes very little persuading, and while on their way to the planet where it can be found, they pick up a distress call from a floating pod, which everyone refers to as 'the projectile'. 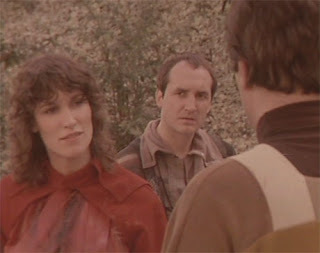 Blake and Jenna teleport onto it to investigate, but when the air runs out and the teleport fails to bring them back, Avon manoevres the Liberator around the pod, while Gan and Vila hold their breath. 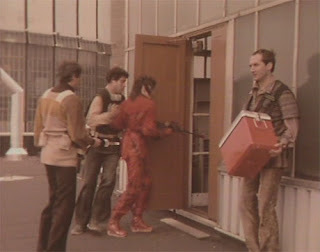 Later, four inanimate 'protectors' on the pod come alive to menance Jenna and Gan, while Blake, Avon and Vila get beamed down for the bits on location and meet new crew member Cally, followed by some nice jogging scenes with Vila carrying the cool-box. It's 1978. It's January 1978. It's the 23rd of January 1978. I have to keep telling myself this or I may be unnecessarily harsh on some of the plot devices brandished by Terry Nation in this particular episode. Although thinking a little more about it, these issues are still inexcusable for the time. "Compensate for orbital drift," says Jenna. "Compensate for a flood of the predictable," say I. 1) "Help, we're running out of air... we might die but it's unlikely this early-on in the episode so really we're just filling." Ah! The old 'air is getting dangerously low' trick as demonstrated by Blake and Jenna on 'the projectile' pod they're investigating. Well it is space I suppose, but come-on: if the Liberator is that clever why allow your occupants to beam on board somewhere with an atmosphere that can't sustain their lives? Was Zen on the Tetris and not paying full attention? Also, you'd think that, since space-suits were featured so heavily in the second episode, it may already be on the crew's minds. 2) "What are these aliens doing frozen in ice/time/rock/jelly, let's rescue them as I'm sure they'll be friendly, or maybe they'll just come to life and try and kill us at an unexpected moment." Basically if you find someone suspended in anything they will be hostile and come to life when you're busy trying to fix something/developing your character/cutting your toenails. Unless they are suspended in earth then they're probably just the buried dead. 3) "Don't attack me - we could be great mates... and you could join the lead cast." Why does everyone always get off on the wrong foot? The other day in the real world (WHSmiths actually) someone whacked their basket into my back and I apologised. Maybe I'm too nice, but just because you have a gun doesn't mean you have to start a fight with everyone after your eyes meet. Telepathic - or editing mistake? And the scene where freedom fighter Cally is introduced is probably the most tense sequence in the entire series so far: not because she has a gun and she and Blake start a fight, but when she starts talking to him telepathically (ie without using her lips), it looks at first like an horrendous editing mistake. You're so worried you're watching an enormous error you forget the drama, and fear for the show's producer and how on Earth he let this scene go out. But then you realise it's what she does. Occasionally. You can imagine the reaction of the over-worked film and video tape editors when they got the script, annoyed they had to get the actress in for a bit of echoey ADR. No wonder Cally used her telepathy less and less as time went on. You see my trust in the show right now. Come on Terry Nation! I need something substantial and credible to happen. On the positive side, the episode scuttles along at a good pace, and I did enjoy the writing, even if the plot offended my sophisticated taste buds (!). The acting is pretty much spot-on, and there's some good character development: Avon and Vila are bickering: given a different route and a modern day remake that could well have been sexual tension between them rather than just plain old tension; while Gan and Jenna share some interesting scenes as the ones who don't get to go outside this week. We learn Gan killed a security guard who in turn had killed 'his woman', and now suffers terrible headaches due to his brain implant that's meant to control his violence, which clearly doesn't work. Oh Gan, I fear for your future, I really do. And with the arrival of Cally, who Blake invites to stay on board the Liberator given her reluctance to return home to Auron, Jenna displays something approaching jealousy - she now has a rival for the spot of Blake's number one lady crew mate. Jenna doesn't have anything to worry about though - not with those leggings. "I think we make a good team," says Gan, reassured that all his crew mates are back on board during the final scene. "Well hooray for us," says Avon, being Avon. Now it's onwards to Centero - pronounced with a 'hard' C, oddly - and off to episode five.